Researchers at the National University of Singapore have created a clever self-driving drone called the Smart Water Assessment Network – the SWAN. These swan-shaped robots swim in Singapore’s waters and assess pollution, drinkability, and temperature, allowing researchers to gather data without scaring people with dangerous-looking traditional water drones. 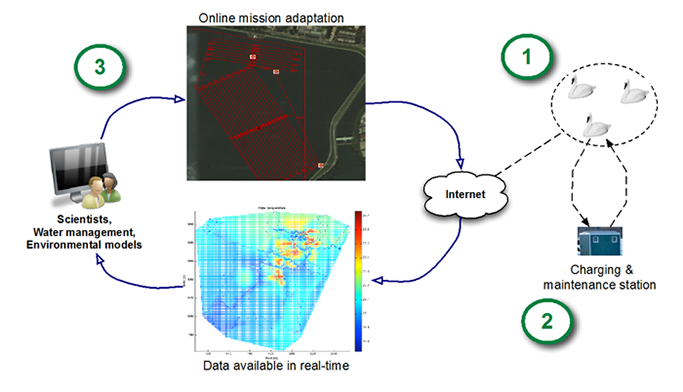 NUSwan – New Smart Water Assessment Network is an innovative concept on spatial-temporal water quality monitoring. Building upon aesthetics and recreation, NUSwan is a comprehensive solution to maximize use of resources and cost effectiveness. It is a simple yet powerful tool to observe the water environment. Its ability to collect data according to directed mission in real-time allow interactive sampling at any location of interest. It has the capability of performing simultaneous multi-node, high speed sensing for observing concentration gradients for better characterization and detection of time varying hotspots. The swans are being used to test the water quality in Singapore’s reservoirs and they’re designed to withstand contact with boats and other dangers of the sea. They are using the swanbots simply because it is far more difficult to gather samples by boat. These swans can swim around pulling samples over time with little to no human intervention and, we assume, they won’t scare away the real swans on the water.